Do you celebrate St. Patrick's Day? I don't really, but as a blogger, I pretty much HAVE to make something for each and every holiday, it is a rule or something. 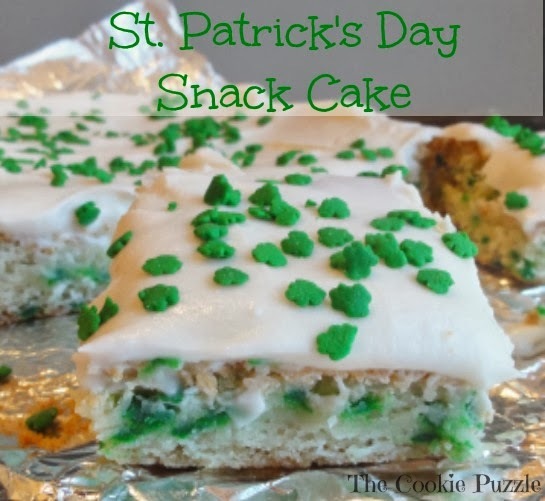 I don't want the Blog Mafia to come get me, so I made a simple quick and easy snack cake. This is one of those quick, I need something sweet type of desserts. You know those time when you want a little something sweet. This is perfect for my house, because my weirdo husband and son are not sweet eaters. Makes me crazy! I like me some sweets, and they don't, so when I make sweets, I am forced to eat them all by myself, this is a little cake, so my hips thank me. For this cake, I cut it in half and froze the other half, so I can have a treat next week. I baked this in a 7x10 baking dish, but you can use a 8x8 or 9x9, or even a 9x13, whatever floats your boat, you just might need to adjust the baking time. I also like to line the baking pan with foil, for easy removal for cutting, of course, this is not a needed step, just a personal preference of mine. You can skip this step and simply use baking spray on the pan. Now, what I really like about this, is that it is totally customizible, you can use any type of sprinkles in the cake and on top you want. Easter, Thanksgiving, Birthday's, Christmas, Fourth of July, the possibilities are endless. Preheat oven to 350 degrees. Line baking dish (I used a 7x10, you could use a 8x8 or 9x9 also) with foil, spray foil with non stick spray. Combine cake mix, melted butter, egg and milk, stir until combine. I stopped at 1/3 cup, but you could add up to 1/2 cup of milk. Gently fold in sprinkles. Spread in baking sheet. Bake for 25-30 minutes until middle is set. Remove from oven, cool completely. Using the foil, remove cake from pan and frost. Cut into squares and serve. In a medium bowl, combine, butter, vanilla and powdered sugar, stir in milk. Spread onto cake, sprinkle with additional sprinkles if desired. Thank you Blair....this is so quick and easy, you can have a yummy cake in under an hour, if you cool it in the fridge. I can not wait to play with other flavors. This looks delicious. I love that you can customize it for the different holidays. Thanks for sharing. OMG Melissa...this is sooo good...and because it is a little firmer then a "normal" cake...you can eat it with your hands, like a brownie....SCORE! I just love this! It's so colorful and festive. I do celebrate St. Patty's Day so any green treat at this time of year catches my eye! Great post! Glad you enjoyed it Colleen. I can not wait to make one for every holiday! I almost flavored it mint...that would have been amazing too! Thank you Cathy! It is yummy....and SWEET...which makes for a perfect cake, in my humble opinion! 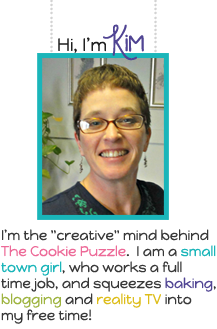 I love my puzzle pieces...they always make me smile.....thanks for noticing, my designer really did a good job at incorporating them. Loosk so cute and so yummy! Thanks so much for sharing this on Worthwhile Wednesdays!